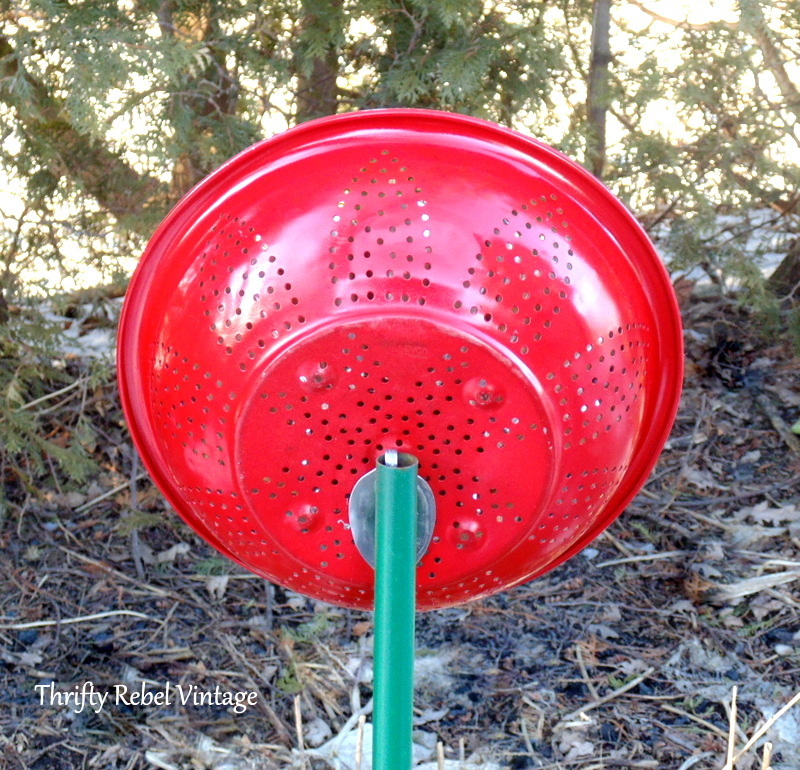 To celebrate the first day of Spring, YAY!, I really wanted to create something for the garden. 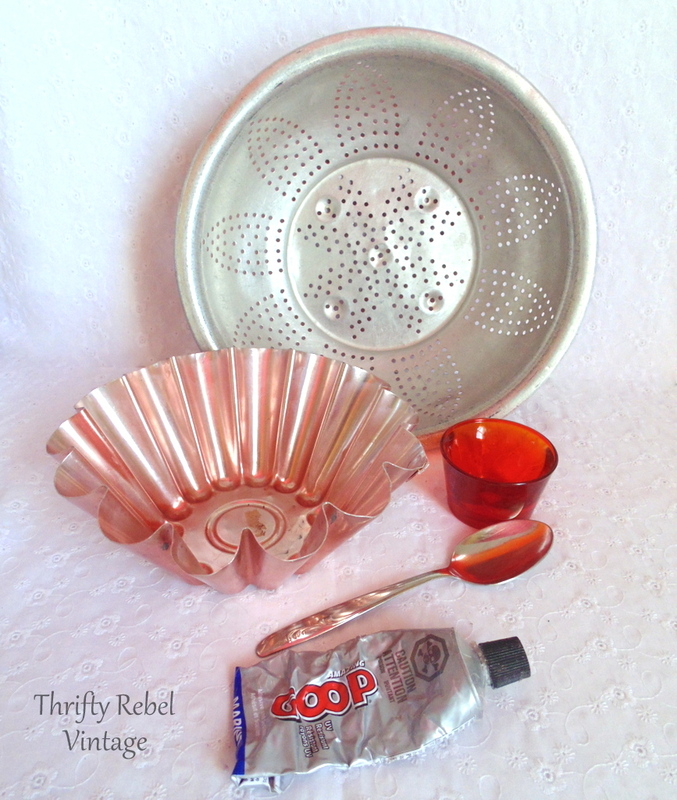 After looking through my stashes I came up with this quick & easy repurposed strainer and jello mold flower. When making whimsical flowers for the garden they can be as fancy as a dish flower, or as rustic as this flower that I’m sharing with you today. It really just depends on what you’re using to create your flower. 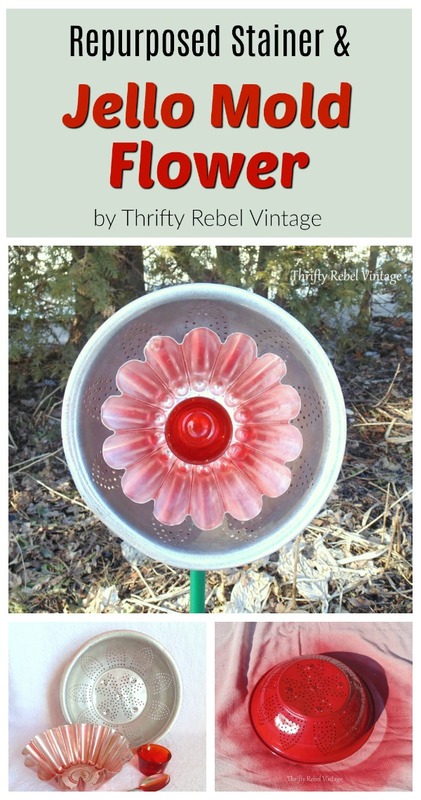 These flowers can be made using things you already have, or keep an eye out for odds and ends the next time you’re at a thrift store or garage sale. 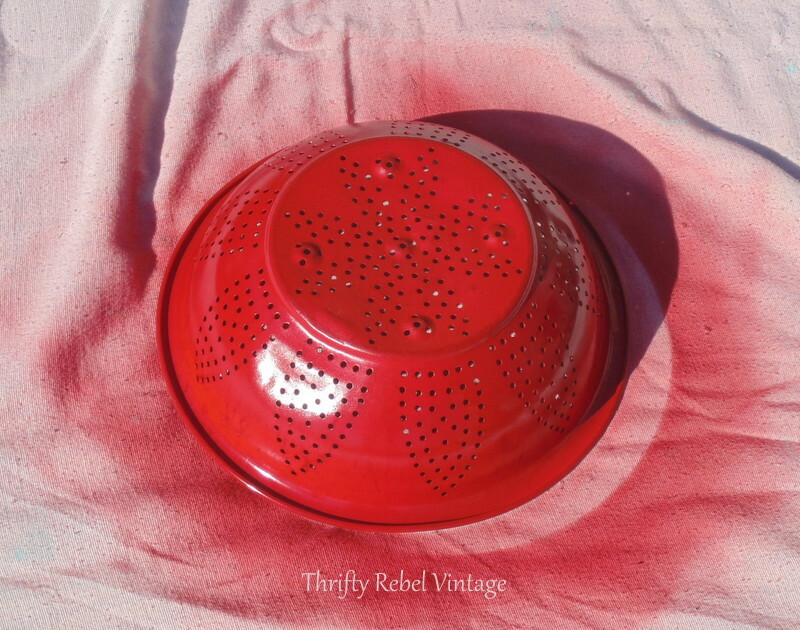 Just for fun I spray painted the bottom of the strainer red. I like my flowers to look good from all sides. 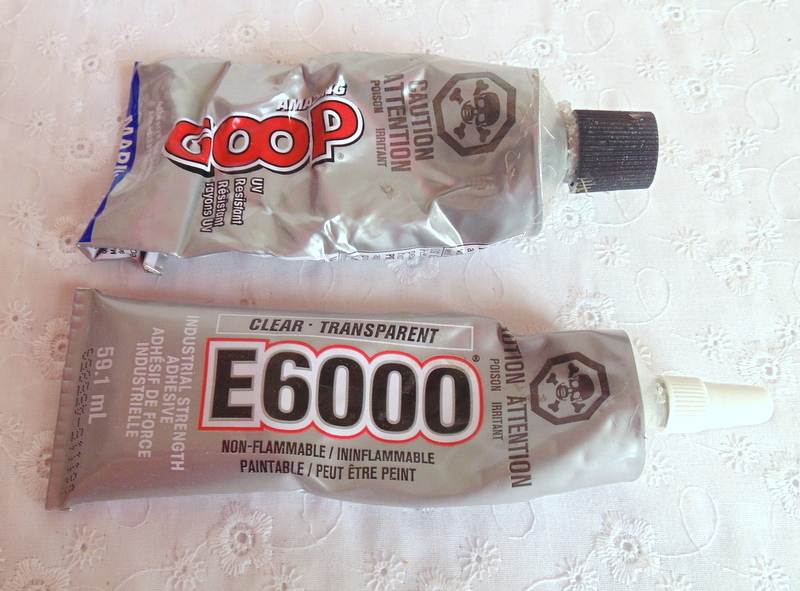 You can use either Marine Goop or E6000 glue, whichever you have access to. When making flowers like this always remember to add the glue to the highest point. 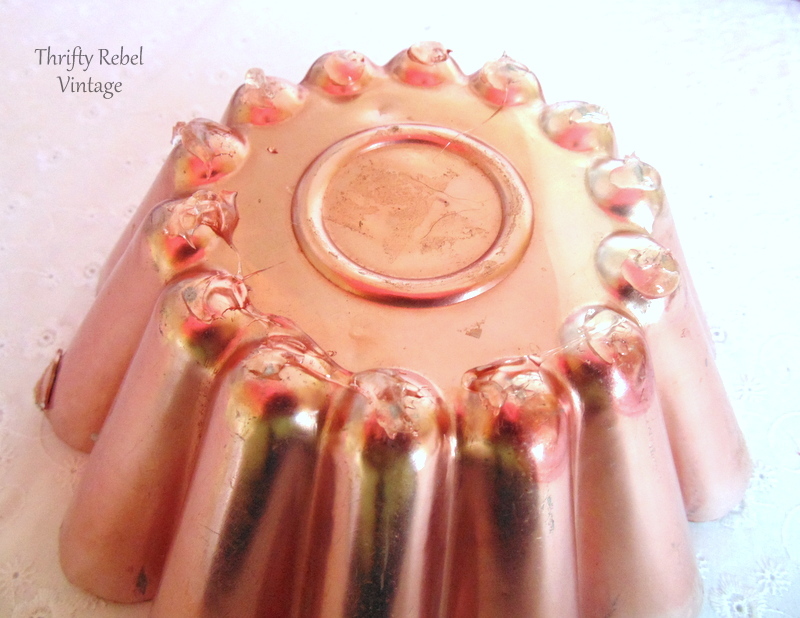 For the copper jello mold that’s the bumps around the outside. 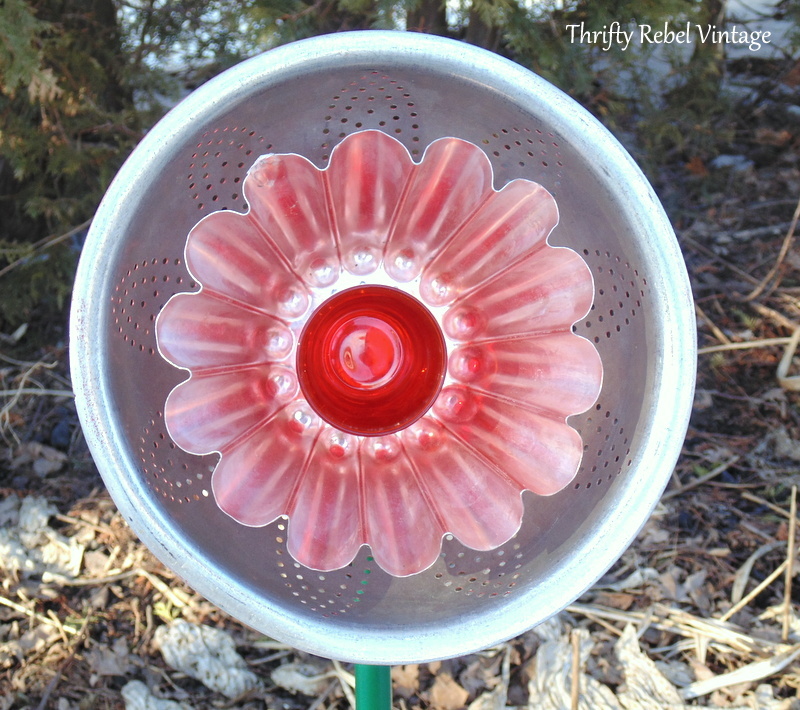 I placed the jello mold into the center of the strainer, wiggling it a bit to get good contact, and then glued the red glass candle holder into the center of the mold. Then I let that cure for 24 hours. 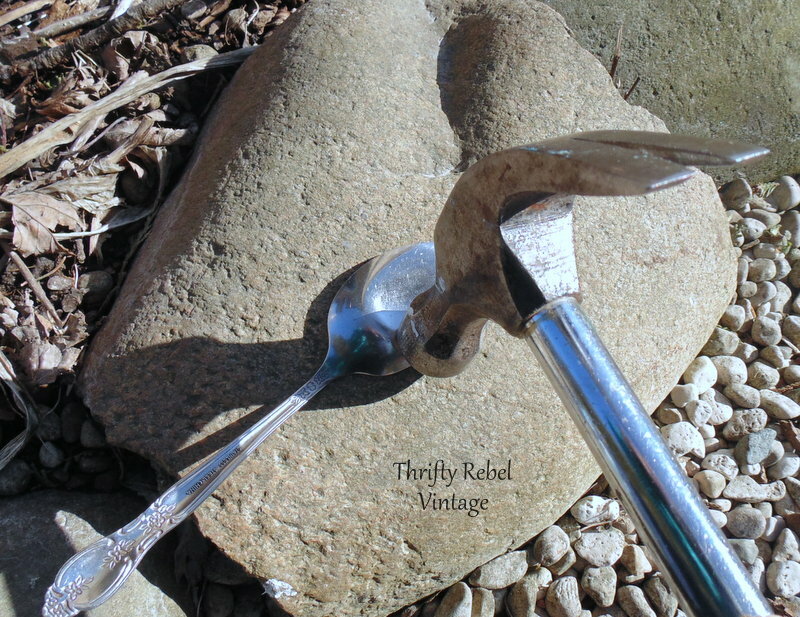 I took the stainless steel spoon outside and had an stress release therapy session. lol. Sorry spoon, but I really did need you to be flat. 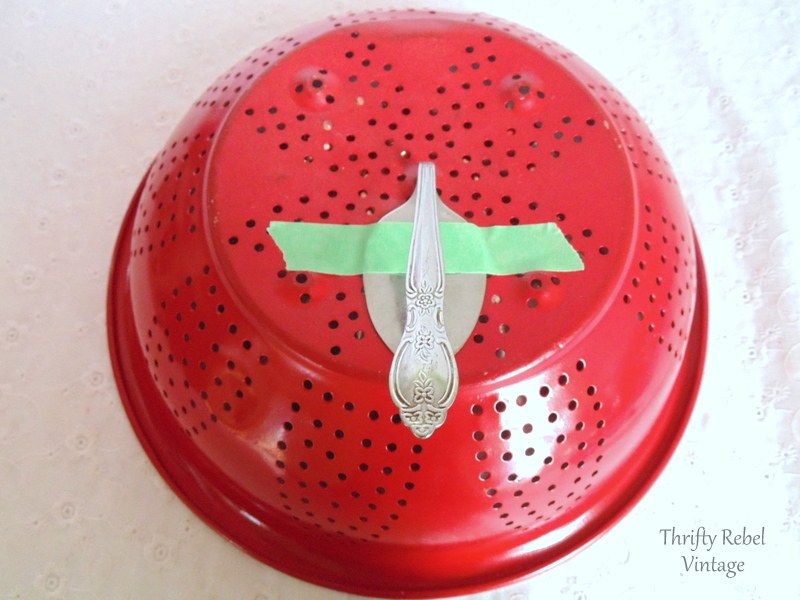 After bending the spoon, I glued it onto the back of the strainer holding it in place with painter’s tape. Again I let the glue cure for 24 hours. Here you can see how the spoon sits nice and snug in the pipe. 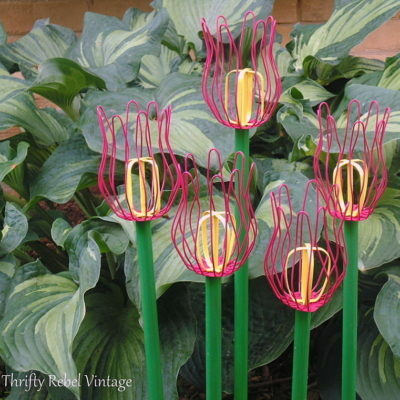 This is a cooper pipe that I spray painted green ages ago and also used for my repurposed steamer/strainer flowers. 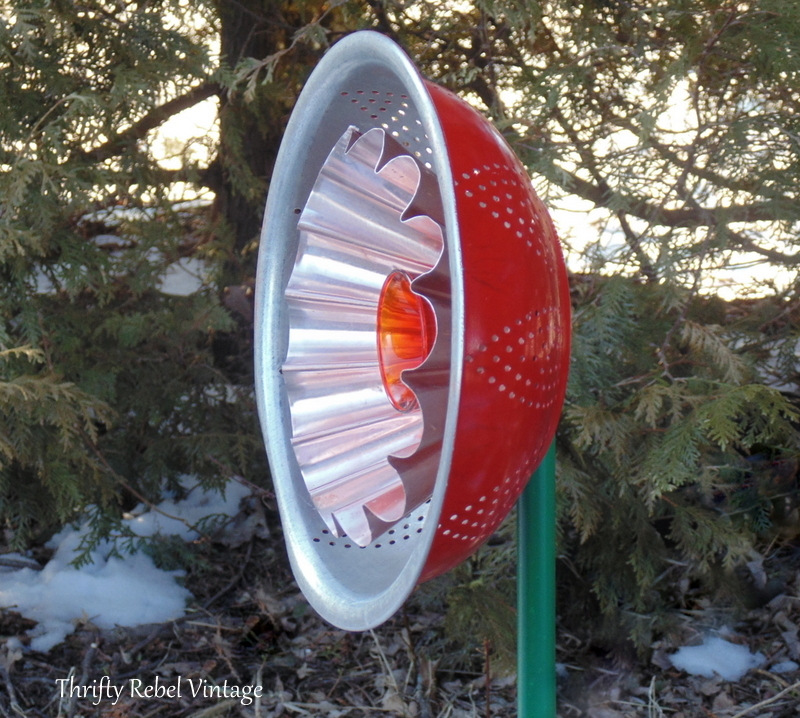 The red back of the strainer is not totally necessary, but it adds another dimension and it ties in with the red candle holder in the center. TIP: If you have cold and snowy winters like I do you should store any flowers that are glued together safely out of the elements. This will help the glue hold for years to come. Regular rain is fine during the warmer months but ice, snow, and freezing temps put a lot of stress on the glue. 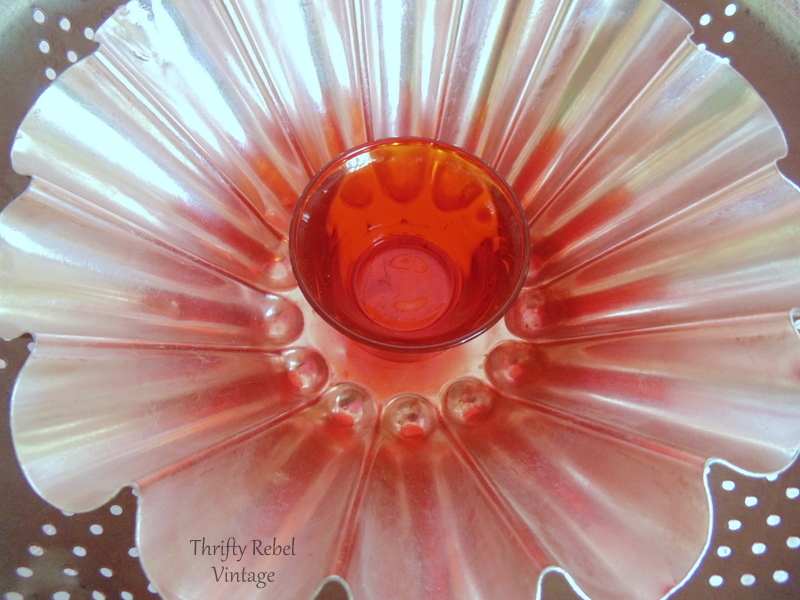 It’s hard to see it in the picture but the light comes through the petal-shaped holes of the strainer so beautifully, and the glass candle holder shimmers inside the copper jello mold. When putting things together for a flower like this I’m always looking at the interplay of the pieces, and what they bring to each other. 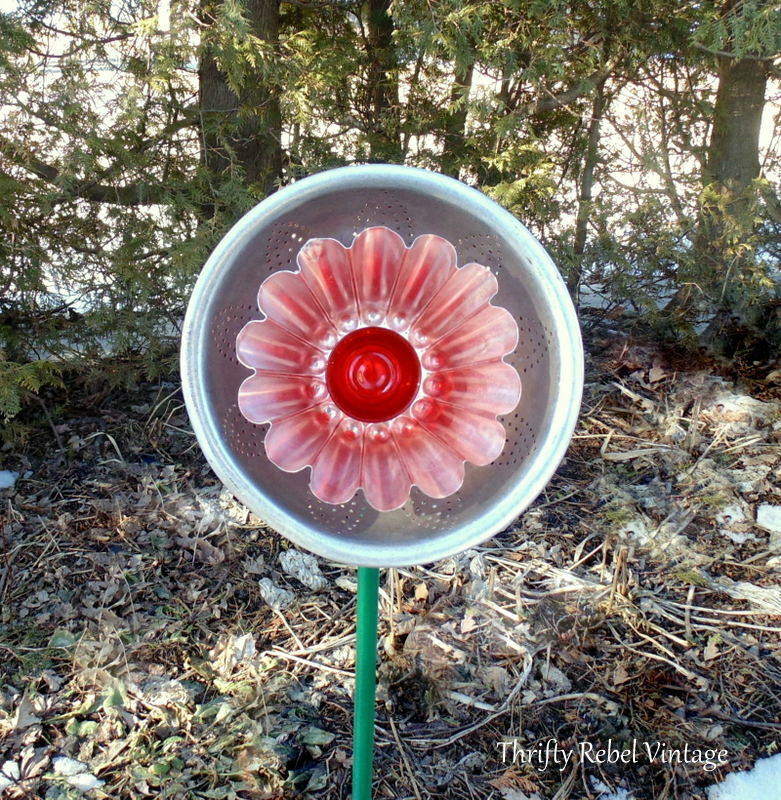 Now I think my jello mold flower needs some fun companions, so when the garden starts coming alive I’ll definitely have to make a few more that are completely different. That’s the great thing about making flowers like this, what you can do is only limited by your imagination. Believe it or, I have everything already on hand, except for the glue that is…….bummer. Used the last of what I had left in the tube a few days ago; I squeezed till I no longer could get any more glue out. Glue………………On my craft item grocery list it goes. Enjoy your week and have a wonderful and joyful weekend. I am a huge fan of your glass garden flowers and these are just as cute. It just so happens that I have been collecting metal molds and old spindles to make flowers. Happy Spring! Very cute. 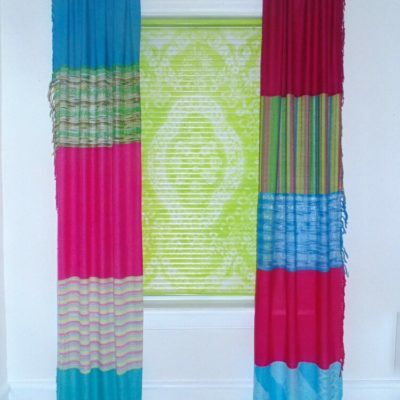 I want to make one. I always admire your garden flowers Tuula! Wish I had one! Thanks Florence! They’re so easy to make and are a great use for misc stash items. This is a keeper! I see birthday gifts for my sisters!! Thanks, Tuula…. always enjoy your posts! Thanks Karolyn! I think flowers like this would make awesome gifts because depending on what you use every flower is one of a kind. Great project! I always get my E6000 glue with a coupon caz it is seldom on sale. Always enjoy your projects! Too cute! I could use several of these late in the summer when my other flowers start to fade. 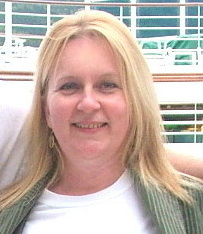 Me too Anita! I think I’ll be making a few more.